The phosphatidylinositol 3 kinase (PI3K) pathway is frequently altered in cancer, including ovarian cancer (OC). Unfortunately, despite a sound biological rationale and encouraging activity in preclinical models, trials of first-generation inhibitors of mammalian target of rapamycin (mTOR) in OC have demonstrated negative results. The lack of patient selection as well as resistance to selective mTOR complex-1 (mTORC1) inhibitors could explain the disappointing results thus far. Nonetheless, a number of novel agents are being investigated, including dual mTORC1/mTORC2, Akt, and PI3K inhibitors. Although it is likely that inhibition of the PI3K/Akt/mTOR pathway may have little effect in unselected OC patients, certain histological types, such as clear cell or endometrioid OC with frequent phosphatidylinositol-4,5-biphosphate 3-kinase, catalytic subunit alpha (PIK3CA) and/or phosphatase and tensin homolog (PTEN) alterations, may be particularly suited to this approach. Given the complexity and redundancy of the PI3K signaling network, PI3K pathway inhibition may be most useful in combination with either chemotherapy or other targeted therapies, such as MEK inhibitors, anti-angiogenic therapy, and hormonal therapy, in appropriately selected OC patients. Here, we discuss the relevance of the PI3K pathway in OC and provide an up-to-date review of clinical trials of novel PI3K inhibitors alone or in combination with cytotoxics and novel therapies in OC. In addition, the challenges of drug resistance and predictive biomarkers are addressed. Ovarian cancer (OC) is the most lethal gynecologic cancer in Europe and North America. This disease typically presents at an advanced stage, and optimal debulking with platinum-based chemotherapy remains the cornerstone of management. Unfortunately, despite frequent initial responses to chemotherapy, these tumors almost invariably relapse. Owing to recent large-scale molecular profiling studies, such as the integrated genomic analyses performed by the Cancer Genome Atlas (TCGA) network, significant progress has been made in the understanding of the molecular pathogenesis of OC. These advances are finally beginning to translate into meaningful clinical benefit for patients. The phosphatidylinositol 3 kinase (PI3K) pathway is frequently altered in cancer, including OC. First-generation inhibitors of mammalian target of rapamycin (mTOR) have demonstrated activity in other tumor types and are currently approved for the treatment of renal, pancreatic, breast, and some brain cancers. In addition, a large number of novel agents targeting PI3K or Akt as well as second-generation mTOR inhibitors are in early clinical trials. This review provides a brief overview of the biology of OC, with a focus on the relevance of the PI3K/Akt/mTOR signaling network, and discusses the rationale for targeting this pathway in OC. Preclinical data and the results of recent clinical trials are also presented. In addition, some of the challenges facing the development of these inhibitors in OC are discussed, including the need for predictive markers and the challenge of drug resistance, as well as strategies for optimizing the development of novel therapies against PI3K in OC. There is mounting evidence that OC is a highly heterogeneous disease with marked differences in molecular profile, histology, prognosis, and chemosensitivity, depending on the subtype[1–3]. The most common subtype is the high-grade serous OC (HGSOC), accounting for over 70% of epithelial OCs. HGSOC is characterized by almost universal p53 mutations (98% of cases), genomic instability, and sensitivity to platinum-based chemotherapy. Unfortunately, despite objective response rates (RRs) of 70%–80% to first-line chemotherapy, advanced HGSOC almost invariably recurs. Except for tumor protein 53 (TP53) mutations, these tumors lack gene mutations commonly described in other solid tumors, such as Kirsten rat sarcoma viral oncogene homolog (KRAS) and phosphatidylinositol-4,5-biphosphate 3-kinase, catalytic subunit alpha (PIK3CA), but are associated with frequent somatic copy number anomalies resulting in gains in oncogenes [e.g., mitogen-activated kinase like protein (MAPK), cyclin E1 (CCNE1), and KRAS] or losses in tumor suppressors [e.g., phosphatase and tensin homolog, (PTEN), neurofibromin 1 (NF1), and retinoblastoma 1 (RB1)] (Table 1 [4,5]). Over 50% of HGSOCs also demonstrate deficiencies in the homologous recombination DNA repair pathway, thus identifying a significant subset of tumors that may benefit from poly(ADP-ribose) polymerase (PARP) inhibitors. The results shown here are in whole or part based upon data generated by the TCGA Research Network (http://cancergenome.nih.gov/). The rare subtypes of epithelial OC include low-grade serous, mucinous, endometrioid, transitional, or clear cell subtypes (Table 2 ), which frequently progress from non-invasive precursor lesions such as cystadenomas, borderline tumors, and endometriosis. The overall prognosis of these subtypes is better than that of HGSOC, which is principally attributable to the fact that they often present at an earlier stage. Unfortunately, in the case of advanced or recurrent disease, these rare subtypes are relatively chemoresistant and also often share histological and molecular features with other cancer types such as renal cell and intestinal tumors. In contrast to HGSOC, these rare subtypes are low-grade, genomically stable and display frequent oncogenic mutations [e.g., KRAS, B-Raf protooncogene, serine/threonine kinase (BRAF), v-erbB2 avian erythorblastic leukemia viral oncogene homolog 2 (HER2), PIK3CA, and PTEN] (Table 2 ). Importantly, a large number of these oncogenic mutations are potentially actionable with novel therapies. The PI3K pathway is a complex signaling network coordinating a number of direct upstream inputs from growth factors [epidermal growth factor (EGF), tumor growth factor (TGF), and others], tyrosine kinase receptors [insulin growth factor 1 receptor (IGF-1R), epidermal growth factor receptor (EGFR), HER2], or other membrane receptors such as Met as well as a RAS-mediated crosstalk with the Ras-Raf-Mek-Erk pathway (Figure 1 ). Networking of the PI3K/Akt/mTOR signaling pathway. PI3K/Akt/mTOR pathway is a central regulator of metabolism, survival, and proliferation in normal tissues and in cancers. Second only to the p53 pathway, this pathway is the one most frequently dysregulated in cancers. In addition to extrinsic activation from upstream growth factor receptors or via crosstalk from RAS, the pathway can be intrinsically and constitutively up-regulated due to activating mutations or amplifications in the positive effectors of the pathway (e.g., PIK3CA/PI3Kp110, Akt, and mTORC1) or via inactivating mutations or the loss of negative regulators of the pathway (e.g., PTEN, PIK3R1, TSC, and LKB1). In the setting of selective mTORC1 inhibition, mTORC2 activates Akt via Ser473 phosphorylation. PI3K, phosphatidylinositol 3 kinase; mTOR, mammalian target of rapamycin; PIK3CA/PI3Kp110, phosphatidylinositol-4,5-biphosphate 3-kinase, catalytic subunit alpha; mTORC1, mTOR complex-1; PTEN, phosphatase and tensin homolog; TSC, tuberous sclerosis complex; LKB1, liver kidney kinase B1; EGF, epidermal growth factor; IGF-1R, insulin growth factor 1 receptor; HER, v-erbB2 avian eryhtorblastic leukemia viral oncogene homolog 2; EGFR, epidermal growth factor receptor; PIP2, phosphatidylinositol 4,5-bisphosphate; PDK1, pyruvate dehydrogenase kinase 1; MDM2, mouse double minute 2 homolog; NF-κB, nuclear factor-κB; CREB, cAMP response element-binding protein; GSK3, glycogen synthase kinase 3; 4EBP1,4E binding protein 1. PI3K proteins are heterodimers composed of a catalytic p110 subunit (PIK3CA) and a regulatory p85 subunit (PIK3R) that mediate receptor binding, activation, and localization of the enzyme. The direct binding to phosphotyrosine residues of growth factor receptors or adaptors through pleckstrin homology domains leads to the allosteric activation of the catalytic subunit and the phosphorylation of phosphatidylinositol 4,5-bisphosphate (PIP2) to the active second messenger PIP3. As a result, the PI3K complex is recruited to the plasma membrane and activates the pyruvate dehydrogenase kinase 1 (PDK1) and Akt proteins. Akt is a serine threonine kinase that regulates a large number of downstream targets [7,8], ultimately controlling critical cellular survival and metabolic processes. For example, Akt regulates downstream p53, nuclear factor-kB (NF-kB), and cAMP response element-binding protein (CREB), leading to the transcription of anti-apoptotic and proliferative genes such as X-linked inhibitor of apoptosis protein (XIAP), Bcl-2, and survivin. Akt also promotes cell cycle progression via cyclin D1 up-regulation. In addition, downstream signaling via mTOR increases the translation of target genes involved in angiogenesis [e.g., vascular endothelial growth factor (VEGF)] or the cell cycle (e.g., cyclin D1 and c-Myc). mTOR is most likely the best described downstream target of Akt[12–14]. The mTOR complex is composed of two components: the mTORC1-Raptor complex and the mTORC2-Rictor complex, the function of which is less well described. Importantly, mTORC1 is sensitive to inhibition by rapamycin, whereas mTORC2 is not; in addition, mTORC2 exerts a positive feedback activation on Akt. As discussed below, this positive feedback loop may have important implications regarding the emergence of resistance to first-generation mTOR inhibitors (rapalogs) that exclusively target mTORC1, with no effect on mTORC2. Importantly, the cellular machinery also contains a number of endogenous negative regulators of the PI3K pathway. The PTEN protein acts as a pathway repressor by dephosphorylating PIP3 back to PIP2. The p85 regulatory subunit of PI3K also functions as a tumor suppressor; its major function is to bind, stabilize, and inhibit the p110 catalytic subunit. The liver kidney kinase B1 (LKB1) acts as a tumor suppressor by negatively regulating mTOR through the activation of protein kinase, AMP-activated, alpha catalytic subunit (AMPK), and the tuberous sclerosis complex 2 (TSC2) is a GTPase-activating protein that negatively regulates mTOR through the small G-protein Rheb. Together, LKB1, AMPK, and TSC2 constitute a stress-inducible pathway that normally counteracts PI3K/Akt signaling[15,16]. In cancer, this pathway can be aberrantly activated via a number of mechanisms. In addition to activation via upstream input, the PI3K pathway can be “intrinsically” up-regulated due to 1) gain-of-function mutations or amplifications in PIK3CA; 2) mutations in PIK3R1/2; 3) mutations or amplifications in one of the Akt isoforms (AKT1, AKT2, and AKT3); 4) loss of or inactivating mutations in the tumor suppressors TSC or LKB1; or 5) loss of the negative regulator PTEN via inactivating mutations, copy number loss, or promoter hypermethylation. The PI3K/Akt/mTOR pathway is frequently deregulated in OC. Array comparative genomic hybridization (aCGH) studies have identified this pathway as the most frequently altered in OC. Copy number changes in the genes encoding both the p110a (PIK3CA) and p110β (PIK3CB) subunits of PI3K have been associated with a poor prognosis in patients with OC. The expression levels of both PIK3CA and phosphorylated Akt (pAkt) were analyzed in over 500 OC and found to be associated with decreased survival, and activation of the pathway, as measured by Akt or mTOR phosphorylation levels, was found to be an independent negative prognostic marker in OC[18–20]. Interestingly, the type of PI3K alteration appears to be histology-specific (Table 3 ). In HGSOC, oncogenic mutations are rare, but amplifications in PIK3CA and in one of the AKT isoforms (AKT1, AKT2, and AKT3) occur in 20% and 10%–15% of cases, respectively, whereas PTEN loss has been described in 5%. Over 35% of HGSOCs may have constitutive up-regulation of the pathway, and another 10%–40% demonstrate hyperactive signaling due to upstream deregulation of receptor tyrosine kinases (RTK), RTK ligands, or RAS. PI3K, phosphatidylinositol 3 kinase; PIK3CA, phosphatidylinositol-4,5-biphosphate 3-kinase, catalytic subunit alpha; PTEN, phosphatase and tensin homolog; TSC, tuberous sclerosis complex; LKB1, liver kidney kinase B1. Mutations are much more prevalent in the rare subtypes of OC: 20% of endometrioid and 35% of clear cell OCs have documented PIK3CA mutations, whereas PTEN loss-of-function mutations are well documented in 20% of endometrioid OC. Importantly, intrinsic activation of the pathway, via PIK3CA mutations and PTEN loss, has been shown to initiate ovarian tumors in mice, and inhibition of PI3K/mTOR in these models was found to delay tumor growth and prolong survival, thus providing critical proof of concept for the oncogenic relevance of this pathway in OC and its potential as a therapeutic target[22,23]. The frequent PI3K/Akt alterations demonstrated in OC patients, combined with the evidence for the dependence on this oncogenic pathway in preclinical models of OC, have provided the biological rationale for investigating the benefit of targeting PI3K, Akt, or mTOR in this disease (Table 4 ). However, as detailed below, the intrinsic complexity of this signaling network may limit the antitumor potential of inhibiting a single effector along the pathway. PLD, pegylated liposomal doxorubicin; RR, response rate; PFS, progression-free survival; PR, partial response; SD, stable disease; NA, not available. The first inhibitors of the pathway to enter the clinic were rapamycin analogs that bind to the mTORC1 complex and prevent mTOR activity. Rapamycin was used for years as an immunosuppressor to prevent rejection in solid organ transplants and hematologic malignancies. Rapamycin analogs with less immunosuppressive properties, such as temsirolimus, everolimus, and ridaforolimus, have shown activity in a number of tumor types and have been investigated in OC. In a phase II trial of OC treated with weekly intravenous injection of temsirolimus at a flat dose of 25 mg, objective responses were observed in only 9.3% of patients (5 of 54), and the 6-month progression-free survival (PFS) rate was 24%, causing the study to fail to meet its efficacy endpoint. Exploratory analyses were also conducted to identify potential predictive markers. pAkt, p-mTOR, p-p70-S6K, and cyclin D1 were measured in archival tumor samples as surrogates for activation of the PI3K pathway, but only cyclin D1 levels were weakly correlated with a PFS of >6 months (r = 0.28). The authors concluded that the observed activity was insufficient to justify a phase III trial of temsirolimus in unselected OC patients. The trial included mainly serous tumors and only a few endometrioid (4 of 54, 7%) or clear cell ovarian tumors (3 of 54, 6%), the two subtypes most likely to demonstrate PIK3CA mutations. Interestingly, 1 of the 3 clear cell ovarian tumors had an objective partial response (PR) to temsirolimus. Recently, other encouraging data were reported for 5 patients with clear cell OC treated with temsirolimus, with 1 objective response lasting 14 months and 1 stable disease (SD). Although the numbers are too small to draw conclusions, these data together with the frequent PIK3CA mutations in clear cell OC suggest that PI3K inhibition may be a promising strategy in treating this OC subtype. Given the limited activity of mTOR inhibitors alone and evidence from preclinical studies suggesting an additive benefit of mTOR inhibitors with chemotherapy, a number of studies have investigated the effects of mTOR-cytotoxic combinations. Phase I studies of temsirolimus with either weekly topotecan or pegylated liposomal doxorubicin (PLD) have been conducted in gynecologic malignancies, but the studies were small, and activity was limited[28,29]. Three other phase I studies of rapalogs in combination with chemotherapy (temsirolimus plus carboplatin/paclitaxel, ridaforolimus plus carboplatin and paclitaxel, and everolimus plus weekly paclitaxel) also included a small number of patients with advanced OC, and the responses were described (3 of 6 patients with OC had a PR to temsirolimus plus carboplatin and paclitaxel). Another phase II trial evaluating the efficacy of temsirolimus and trabectedin in patients with recurrent clear cell carcinoma was performed, with no treatment discontinuations due to unmanageable adverse events. Among the 17 patients enrolled, the objective response rate (ORR) was 18%, including 1 patient with complete response (CR) and 5 (29%) with SD beyond 3 months, resulting in a clinical benefit rate (CBR; CR + PR + SD > 3 months) of 47%. However, given the small number and the use of different chemotherapeutics in the combination studies, it is difficult to draw conclusions regarding the true added value of an mTOR inhibitor. Several hypotheses have been proposed to explain the disappointing results observed to date with mTOR inhibitors. First, data from other tumor types such as renal cancer suggest that mTOR inhibitors may have more of a cytostatic, as opposed to a cytotoxic, effect, with a benefit mainly in terms of disease stabilization and PFS improvement rather than tumor shrinkage. The phase I and II trials conducted to date with mTOR inhibitors in OC have been single-arm studies in which the primary efficacy endpoint was usually ORR. Other hypotheses have also been proposed: 1) rapalogs may be poor inhibitors of the pathway due to feedback loops and early escape mechanisms, better pathway inhibitors may be needed; 2) mTOR inhibitors may have limited activity in an unselected population and require predictive biomarkers to select for the subset of patients most likely to benefit; and 3) PI3K inhibition alone may be insufficient, and combination strategies may be required. Each of these hypotheses is addressed in turn below, and strategies to improve efficacy are proposed. A number of hypotheses have been generated by in vitro and clinical observations to account for the modest antitumor effect achieved with the first-generation mTOR inhibitors. Early on, paradoxical increases in pAkt were identified in preclinical models and in tumors from patients treated with mTOR inhibitors. As illustrated in Figure 2 , rapalogs suppress mTORC1 but do not affect the other subunit of mTOR, mTORC2. mTORC2 is a positive regulator of Akt, and selective inhibition of mTORC1 results in compensatory Akt phosphorylation at serine 473. Rapalog-induced secondary Akt activation has been proposed as one of the mechanisms accounting for resistance to first-generation inhibitors in the clinic. In addition, although the function and downstream effectors of mTORC2 are less well described, it is reasonable to expect that complete abrogation of the entire mTOR complex may be required to achieve a robust antitumor effect. As a result, dual mTORC1/mTORC2 inhibitors have been developed, such as DS3078a, INK128, AZD8055, OSI027, and AZD2014 (previously reviewed). Proposed mechanisms accounting for resistance to inhibitors of the PI3K pathway. ➀ Selective blockade of mTORC1 by rapalogs increases mTORC2 and results in the positive feedback activation of pAkt. ➁ Inhibition of mTOR removes the basal inhibition of IRS-1, which is now free to bind to and activate IGF-1R and promote PI3K activation. ➂ In the presence of constitutive activation of KRAS, abrogation of the PI3K pathway alone does not inhibit cancer cell growth. IRS-1, insulin receptor substrate-1. Other abbreviations as in Figure 1. In addition, inhibitors acting upstream of mTOR may produce a more effective abrogation of signal transduction. Accordingly, Akt or PI3K inhibitors have been developed and tested in OC. Akt inhibitors are steadily advancing through clinical development because, acting upstream of mTOR, they are expected to more effectively knock-down signal transduction, thereby improving antitumor effects. Allosteric inhibitors such as MK2206 as well as ATP-competitive catalytic inhibitors such as GSK690693 and GDC-0941 are available. The toxicity of both allosteric and catalytic inhibitors of Akt have been shown to be similar to those observed with mTOR inhibitors and include hyperglycemia, rash, stomatitis, and gastrointestinal adverse events. One of the first inhibitors in clinical development was the lipid-based inhibitor perifosine, and preclinical studies showed that perifosine inhibited OC cell proliferation and potentiated paclitaxel sensitivity in vitro and in vivo. On this basis, a phase I trial of perifosine and docetaxel in platinum- and taxane-resistant OC was conducted (Table 5 ). In this study, 21 patients were enrolled, including 11 treated with perifosine at the maximum tolerated dose (MTD) of 150 mg. No dose-limiting toxicities (DLTs) were observed, though frequent adverse events included nausea, vomiting, anorexia, constipation, and fatigue. With regard to efficacy at the MTD in the 11 patients, 1 PTEN-mutated endometrioid cancer patient achieved PR, and 1 PIK3CA-mutated clear cell tumor patient had SD maintained for 4 months. Two other patients without apparent PI3K alterations had SD, whereas 2 with KRAS mutations progressed quickly. MTD, maximal tolerated dose; AUC, area under curve; SD, stable disease; ORR, objective response rate. GSK795 is an oral ATP-competitive pan-Akt inhibitor, and a small phase I pharmacodynamic and pharmacokinetic study in advanced platinum-resistant OC showed reduced fluorodeoxyglucose (FDG) metabolism in the majority of tumors. Among 5 patients treated at high dose levels, paired pre- and post-treatment tumor biopsies demonstrated down-regulation of pAkt and the tumor proliferative marker Ki67. Two patients achieved PFS of >6 months, with radiological objective tumor regressions of 26% and 11%, respectively. Preliminary results from a phase I study (NCT01653912) evaluating the clinical efficacy of the Akt inhibitor GSK2110183 in combination with carboplatin and paclitaxel in patients with platinum-resistant OC showed an ORR of 50% among patients treated at the MTD identified during the dose escalation phase (125 mg daily) . These are particularly encouraging results because the trial recruited mainly platinum-resistant or refractory patients, in whom a RR to chemotherapy of 15% would be expected. These data suggest the hypothesis that Akt inhibition may modulate platinum resistance, and the expansion phase of the trial is ongoing. A number of other studies investigating the benefit of Akt inhibitors in OC are ongoing, and a phase II trial (NCT01283035) of the oral allosteric inhibitor (MK2206) of AKT1, AKT2, and AKT3 has just completed the recruitment phase. This study selected patients with platinum-resistant ovarian tumors and proven PIK3CA mutations, AKT mutations, or PTEN loss. Another phase I/II study (NCT01653912) is evaluating the clinical efficacy of the Akt inhibitor GSK2110183 in combination with carboplatin and paclitaxel in patients with platinum-resistant OC. GDC0941 is an oral selective class I PI3K inhibitor that has shown evidence of clinical activity in 3 patients enrolled in a phase I trial, including 1 PTEN-negative OC patient who remained in the study for 5 months with an FDG-PET response, a >50% decrease in pS6 staining in paired biopsies, and a 80% decrease in cancer antigen 125 (CA125) level. A trial of the selective PI3K inhibitor XL147 in combination with carboplatin and paclitaxel demonstrated that the combination was feasible, with no evidence of pharmacokinetic interactions or overlapping toxicities, and dose-expansion cohorts are ongoing in OC. Furthermore, a dose-escalation phase I trial with BKM120, an oral PI3K inhibitor, has shown that the drug is well tolerated at the MTD of 100 mg once a day, with rash, hyperglycemia, diarrhea, and mood alterations in over one-third of patients. This drug is at more advanced stages of clinical development in other tumors such as breast cancer. In light of the heterogeneity of OC, predictive as well as pharmacodynamic biomarkers are urgently needed to select the patients most likely to respond. Early studies have demonstrated greater anti-proliferative activity of PI3K pathway inhibitors in PTEN-null or PIK3CA-mutated OC cell lines[43–45], and Di Nicolantonio et al. showed that PIK3CA mutations sensitized cancer cells to everolimus. Janku et al. conducted mutational analyses on 140 patients with breast and gynecologic malignancies (including 60 with OC) enrolled in phase I trials of PI3K/Akt/mTOR inhibitors and demonstrated that the RR was higher in patients with PIK3CA-mutated tumors than in those without PIK3CA mutations (30% vs. 10%). The authors concluded that PIK3CA mutations predicted a response to PI3K inhibition. However, all “responders” were actually treated in trials of temsirolimus, bevacizumab, and liposomal doxorubicin. Given the known activity of bevacizumab and liposomal doxorubicin in OC and the fact that half of the responding patients had never been previously exposed to liposomal doxorubicin, mutations may simply be a good prognostic marker and associate with a response to treatment in general rather than to PI3K inhibitors in particular. More recent clinical and preclinical studies have reported contradictory associations between PI3K mutations or PTEN loss and response to inhibitors of the PI3K pathway[47,48]. In particular, a significant number of PI3K-mutated tumors failed to respond, whereas a proportion of tumors lacking PI3K and PTEN alterations benefited from the treatment. This is in contrast to the much stronger association between activating mutations and response to targeted agents such as EGFR or BRAF inhibitors. In a pooled analysis of 3 trials of mTOR inhibitors in endometrial cancers, MacKay et al. found that PI3KCA or PTEN alterations were frequent but did not associate with a response or benefit from mTOR inhibitors. This could be explained by the fact that the mutation analyses were conducted on primary tissue samples and as such may not accurately capture the genomic profile of relapsed disease. Most biomarker studies to date have focused on PIK3CA mutations. However, the most common type of OC, HGSOC, is unlikely to exhibit these mutations. HGSOC is more prone to copy number alteration. Whether PIK3CA or AKT1/2/3 amplifications might confer sensitivity to PI3K inhibition in HGSOC has never been investigated. Mechanistic studies in preclinical models as well as CGH analyses of HGSOC tumor samples from patients treated in ongoing phase I/II trials of PI3K inhibitors would be therefore useful in this regard. Finally, another approach has been the use of gene expression signatures of pathway activation as predictive biomarkers. For example, a low-RAS signature has been derived in silico from 3 publically available datasets and was shown to associate with sensitivity to the AKT inhibitor MK2206 in vitro. These scores, derived from multiple gene signatures, may offer a more comprehensive read-out of pathway activation than individual mutations and, as discussed below, are being incorporated into phase I studies to select patients for PI3K inhibitor combinations. For now, however, it remains unclear whether a signature derived from a gene expression profile can provide a better measure of the level of activation of the PI3K pathway than individual genomic alterations. In conclusion, although biomarker-positive (PTEN-negative or PIK3CA-mutated) tumors may demonstrate a higher response to PI3K inhibitors, a proportion of biomarker-negative patients also respond. In light of the imperfect association between alterations of the PI3K pathway and response to PI3K pathway inhibitors, most ongoing trials are enrolling an unselected patient population; the key will be to conduct detailed molecular analyses to identify candidate predictive biomarkers. The mTOR/Akt/PI3K pathway is promiscuous and interacts with a number of other intracellular signaling networks, such as the IGF-1R or RAS pathways, which can allow treatment escape. For example, IGF-1R can become activated by mTOR inhibition (Figure 2 ). Indeed, insulin receptor substrate-1 (IRS-1) is normally under basal negative regulation via phosphorylation by mTOR. However, mTOR inhibition abolishes IRS-1 phosphorylation, thus allowing IRS-1 to complex with IGF-1R and promote Akt signaling, and thereby generating a mechanism for escape from selective mTOR inhibition. Pleiotropic interactions with other parallel pathways may also allow escape from PI3K inhibition. Akt has been shown to be phosphorylated via crosstalk with RAS. Thus, in KRAS-mutated tumors primarily driven by a constitutively up-regulated RAS pathway, PI3K pathway inhibitors alone are unlikely to be effective. This hypothesis is supported by studies demonstrating that KRAS- or BRAF-mutated tumors are resistant to PI3K inhibition. Using a panel of cell lines, including OC cell lines, PI3K-mutated tumors were shown to be sensitive to everolimus, whereas dual PIK3CA/KRASor PIK3CA/BRAF-mutated tumors were found to be resistant. Importantly, these authors also demonstrated that the knock-down of mutated KRAS in these cells restored everolimus sensitivity in vitro and in vivo. In mouse models and human tumors, everolimus increased Erk1/2 activation in post-treatment tumor samples, providing further evidence for crosstalk between the PI3K/mTOR and Mek/Erk signal transduction cascades. Overall, these observations suggest that the selective targeting of one pathway may simply result in compensatory up-regulation in another, and vice versa. Therefore, given the presence of redundant pathways and the adaptive capacity of cancer cells, drug combinations are increasingly being investigated in an effort to abrogate both primary and acquired resistance to PI3K pathway inhibitors (Table 6 ). For this purpose, different approaches have been undertaken, including targeting the same pathway at different levels (vertical combinations) or concerted inhibition of PI3K and parallel pathways (horizontal combinations). PI3K, phosphatidylinositol 3 kinase; ER, estrogen receptor; PgR, progesterone receptor; EGFR, epidermal growth factor receptor; IGR-1R, insulin growth factor 1 receptor; RR, response rate; PFS, progression-free survival; OS, overall survival; SD, stable disease; PR, partial response; NOS, not otherwise specified. As previously discussed, positive feedback loops generated by selective mTOR inhibition may result in paradoxical activation of Akt via mTORC2 and account for early resistance. Thus, co-targeting mTOR together with upstream modulators of PI3K or Akt to overcome positive feedback may provide a more effective strategy. The combination of everolimus with the PI3K inhibitor PI-103 abolished mTOR inhibitor-induced Akt phosphorylation and significantly increased the anti-proliferative effect of everolimus in OC cells. Other studies are exploring the benefit of inhibiting downstream effectors such as p70S6 in combination with everolimus (NCT01115803). The PI3K pathway is primarily activated by upstream membrane receptor kinases, and preclinical data suggest that concurrent inhibition of mTOR and EGFR may result in synergistic antitumor effects. Studies are investigating the benefit of dual mTOR/EGFR blockade. A completed phase I trial showed that the combination of everolimus, bevacizumab, and the anti-EGFR antibody panitumumab was well tolerated, and 3 patients with OC achieved prolonged disease control for 11 to >40 months. In addition, given the proposed escape from mTOR inhibitors via IRS-1, studies combining IGF-1R and mTOR inhibition have shown that treatment is feasible, with an acceptable toxicity profile, and one study is evaluating the combination of the anti-IGF-1R antibody dalotuzumab with either ridaforolimus or the Akt inhibitor MK2206 in biomarker-selected platinum-resistant OC (NCT01243762). For the OC expansion cohort, patients were selected on the basis of a “low-Ras” signature and high IGF-1 expression levels and were randomized to receive dalotuzumab with either ridaforolimus or MK2206. A total of 16% of patients screened were biomarker-positive, and 12 were treated. There were no objective responses but 3 cases of SD. Another study (NCT01708161) is evaluating the combination of the PI3K alpha-isoform-specific inhibitor BYL719 with the anti-IGF-1R antibody ganitumab in patients with PIK3CA-mutated or -amplified OC. 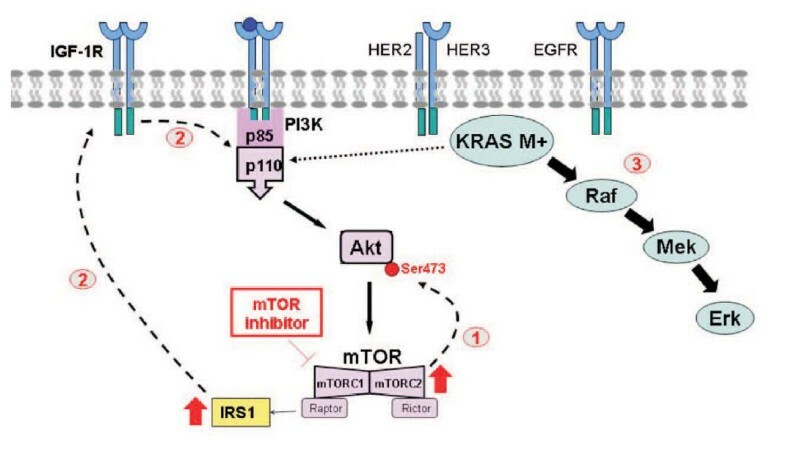 Given the evidence that oncogenic activation of the Ras pathway may be associated with resistance to mTOR inhibitors, targeting both the PI3K and Ras pathways simultaneously is being investigated. In a mouse model of OC driven by PTEN loss and KRAS mutation, simultaneous blockade of both PI3K and MEK signaling using pharmacologic inhibitors resulted in significant tumor regression and prolonged survival compared to monotherapy. An ongoing phase I study is selecting patients with advanced tumors on the basis of KRAS, BRAF, or PIK3CA alterations and investigating the association of the PI3K inhibitor BYL719 with the MEK inhibitor MEK162. Fifty-eight patients have been enrolled to date, and grade 3–4 adverse events were found to occur in 80% of patients, mainly gastrointestinal and skin toxicities. Early data in the OC expansion cohort in this trial have shown 3 PRs among 4 patients with KRAS-mutated OC. The outcome of genotype-matched treatment in rare OC subtypes has been recently presented. Forty-nine patients with low-grade serous (80%), mucinous (10%), or clear cell (10%) OC underwent molecular screening using a Clinical Laboratory Improvement Amendments (CLIA)-approved targeted sequencing test. Only 8% (4 of 49) exhibited an alteration of the PI3K pathway (defined as either a PIK3CA, AKT1, or PTEN mutation), with 60% harboring a RAS mutation. Thirteen patients with a RAS mutation were oriented toward a trial with a PI3K and an MEK inhibitor, and the ORR was 46%. These two studies provide preliminary data to support further trials investigating the benefit of dual PI3K/MEK blockade in OC; however, cumulative toxicities will need to be closely monitored. Given the activity of VEGF inhibitors in OC and the fact that downstream targets of mTOR include angiogenic genes, trials of mTOR and VEGF inhibitors in combination have been conducted in OC. In fact, clear cell OCs with their reported angiogenic signature, increased hypoxia inducible factor-lalpha (HIFIα) signaling and homology to clear cell renal cancers, may be particularly suited to a therapeutic strategy combining traditional anti-angiogenics with PI3K pathway inhibitors. A phase II trial of temsirolimus and bevacizumab in 31 OC patients has been conducted. Adverse events included fatigue, mucositis, hypertension, and neutropenia. In addition, 1 grade 4 rash and 2 colonic perforations were reported. Although the confirmed PR rate was only 12% in the first 25 evaluable patients (all platinum-resistant patients), the 6-month PFS rate of 56% (14 of 25) met the efficacy criteria, justifying progression to second-stage accrual. The study only enrolled patients who had not been previously exposed to anti-angiogenics, and the previously reported ORR of 15%–21% in early trials of bevacizumab monotherapy in OC raises the concern that temsirolimus may be adding little antitumor effect to bevacizumab alone[65,66]. In fact, a randomized phase II trial of bevacizumab alone or in combination with everolimus was recently presented. Although the RR was increased by the combination of the two drugs (19% vs. 9%), it did not result in an improvement in either PFS or OS, and the combination was associated with significantly higher intestinal, metabolic, and hematologic toxicities. HGSOC tumors demonstrate both frequent homologous recombination defects (50% of HGSOCs) and frequent up-regulation in PI3K signaling. The association of the PI3K inhibitor BKM120 and the PARP inhibitor olaparib was shown to be synergistic in HGSOC xenografts. Furthermore, a phase I trial of BKM120 and olaparib showed that the combination was well tolerated, and some activity was observed. Despite that a subset of OC express hormone receptors, endocrine therapy has remained largely investigational in gynecologic malignancies. Early data have shown only modest RRs, most likely attributable to the fact that these studies included patients regardless of tumor hormone receptor expression. 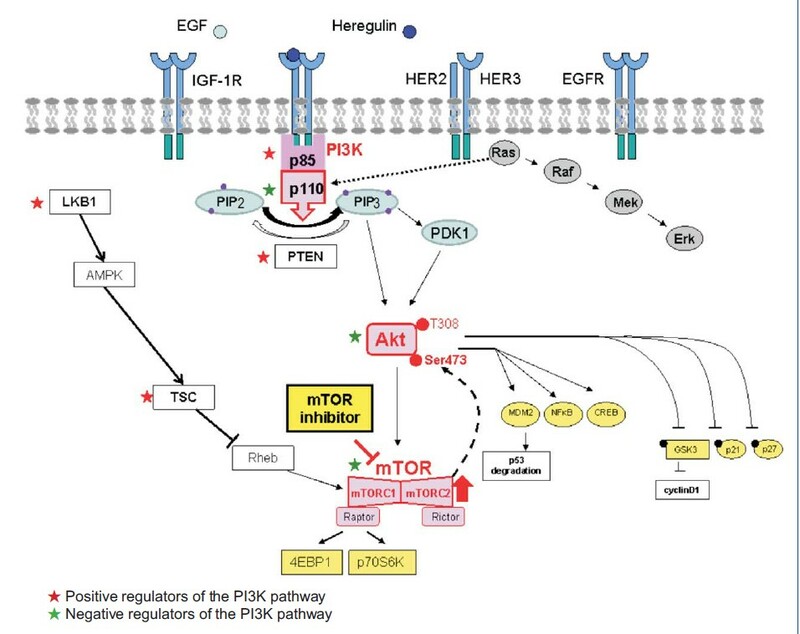 In breast cancer, the crosstalk between the estrogen receptor (ER) and PI3K pathways has been shown to compromise hormone responsiveness in ER-positive tumors, and a large phase III trial has clearly demonstrated the benefit of combining an mTOR inhibitor and exemestane in anastrozole- or letrozole-resistant breast cancer. The association of everolimus and letrozole was tested in gynecologic malignancies and resulted in a CBR (PR + SD >6 months) of 20% among 10 OC patients. Hormone receptor-positive, low-grade endometrioid ovarian tumors that also frequently display PTEN or PIK3CA mutations may be especially suitable for the combined inhibition of PI3K and ER signaling. There has been little improvement in survival in advanced OC patients in the last few decades. Despite recent advances in the genomic characterization of this disease, successful targeted therapies are still lacking in OC. The PI3K pathway is emerging as an important and viable therapeutic target. However, evidence for efficacy in OC remains limited, and predictive biomarkers to identify the patients most likely to benefit from this approach are urgently needed. To date, there is not sufficient evidence for selecting patients for PI3K inhibitor trials on the basis of specific molecular alterations, such as PIK3CA or PTEN mutations. It is critical that future trials enrolling unselected patient populations include parallel biological studies in an effort to reveal candidate biomarkers. Conventional endpoints such as the response assessed according to the Response Evaluation Criteria in Solid Tumors (RECIST) may not be appropriate for evaluating the activity of inhibitors of the PI3K pathway, which may result in disease stabilization rather than objective tumor shrinkage. A number of subtle deviations from the traditional trial design could help to improve the likelihood that novel PI3K inhibitors will be successfully transferred from preclinical testing to early- and late-phase trials. In the case of the most common OC subtype HGSOC, chemotherapy remains a central component of the therapeutic strategy, and PI3K inhibitors could be investigated either as maintenance after chemotherapy in the setting of platinum-sensitive disease or in combination with chemotherapy in an effort to restore chemosensitivity in the setting of platinum-resistant disease. Whether HGSOC could be selected for such strategies on the basis of biomarkers is unknown. As HGSOC tumors demonstrate frequent amplifications in various effectors of the PI3K pathway such as AKT or PIK3CA, specific preclinical and translational studies will be required to determine whether these genomic alterations are associated with sensitivity to PI3K inhibitors. In general, histology-specific trials would be useful. Rare OC subtypes have a very different molecular profile and a poor responsiveness to standard chemotherapy. These histological subtypes should be the focus of dedicated trials. Given frequent and sometimes co-existing alterations in the RAS and PI3K pathways in low-grade serous OC, combination studies of MEK and PI3K inhibitors may be appropriate in this subgroup. Low-grade serous and endometrioid ovarian tumors frequently express hormone receptors; thus, combining endocrine treatment with PI3K inhibition in these subtypes is worthy of investigation. Finally, clear cell OCs have frequent PIK3CA mutations and may be particularly suited to inhibitors of the PI3K pathway. Given the complexity and redundancy of the PI3K signaling network, combined targeting may be required, although cumulative toxicities may prohibit certain associations, such as mTOR inhibitors and anti-angiogenics. It is crucial that efforts are made to reveal resistance mechanisms, develop rational combinatorial strategies, and identify predictive biomarkers.